In this area of the Apparel Search fashion brand directory, you will find women's fashion brands from leading apparel companies and fashion designers. On this particular page, you will find information regarding women's clothing with the L.L. Bean brand. 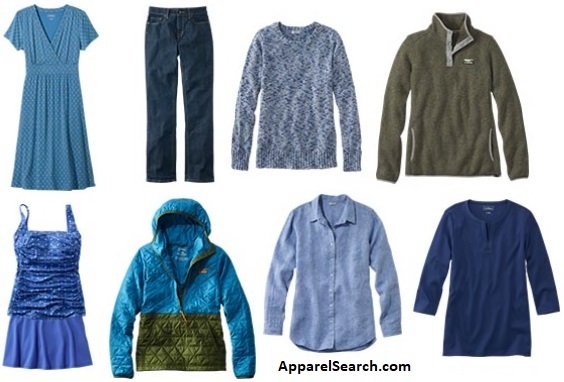 You are welcome to utilize this section of our clothing guide to review L.L. Bean news, L.L. Bean blog posts, L.L. Bean photos, and more. At L.L.Bean, they design products that make it easier for families of all kinds to spend time outside together. They believe the more time you spend outside together, the better. That’s why the L.L. Bean company designs products that make it easier to take longer walks, have deeper talks and never worry about the weather. It’s like their founder always said – being outside brings out the best in us. When discussing L.L. Bean we certainly can't forget to talk about the boots. Just as when Leon Leonwood Bean created them in 1912, the L.L Bean duck boots combine the waterproof protection of rubber-bottom boots with the supple comfort of full-grain leather. Whoever says “they don’t build things like they used to,” doesn't own these boots. Today, their signature “duck” boots are still sewn right here in Maine – one pair at a time – by expert craftspeople whose technical skills and passion for their work is evident in every pair of boots they make. Warm, dry feet haven’t gone out of style in a hundred years, so we haven’t needed to change L.L.’s innovative 1912 design. Obviously they have many other footwear styles as well. Learn more about the L.L. Bean women's clothing brand. From the birth of the boot to road trips in their king-sized Bootmobile, a lot can happen in over a hundred years. In 1911, Leon Leonwood Bean invents the Maine Hunting Shoe. “L.L.” returned from a hunting trip with cold, damp feet and a revolutionary idea. By combining leather uppers with rubber bottoms, he created an innovative boot that changed footwear forever. In 1924, L.L. introduces his iconic Field Coat. Originally called the Maine Duck Hunting Coat, it was an instant favorite with hunters. In 1934, the Zipper Duffle debuts. Featuring a breakthrough device called the “hookless fastener” (aka “zipper”), the duffle became an L.L.Bean mainstay. In 1951, 1951 Ladies’ Department opens. The women’s showroom opened after L.L.’s daughter-in-law, Hazel, and wife, Claire, convinced L.L. that women needed something to do while their husbands shopped for fishing tackle. 1965 The iconic Norwegian Sweater first appears. Inspired by the heavyweight sweaters “used by Norwegian fishermen who require unusual durability and warmth,” the sweaters developed an instant following. 1987 “Sunrise over Katahdin” logo is revealed. After the company donated the land around Katahdin Lake to Baxter State Park in Maine, it introduced its Katahdin logo – symbolizing the beauty of the outdoors. This is just a few of the many achievements from this iconic clothing company. If you have changed your mind and do not wish to research the brand L.L. Bean, you can use the search engine on this page to find another clothing label that may be of more interest. Apparel Search is a leading guide to fashion, style, clothing, glam and all things relevant to apparel. We hope that you find this L.L. Bean page to be helpful. Meet up with people in your community who are maintaining trails and lend a hand, reach out to your local conservancy or just do some gardening. Leave the office and take five under a tree, learn how to kayak or go for a hike – head to the peak and take in the view. Or just grab the hand (or paw) of someone you love and get out there.